Square Dancing is Fun for Everyone! Contact Kevin and he’ll come thru your door and call a fun event for your group! 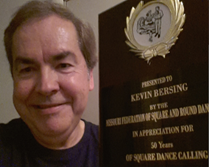 Kevin started square dancing in the Boston, MA area in 1964, has called in over half the United States and Canada while currently located in St Louis, MO. An active member of CALLERLAB Kevin is also a past President of the St Louis Callers Guild and is an active member and past officer of OCCA. He has recorded on the Quadrille ( 'Devil’s Eyes Were Blue' ) and Solid Gold ( 'Got A Rock and Roll Heart' ) labels. Kevin calls and teaches throughout the Midwest, and also travels regularly to call for clubs & conventions in NY, NJ and all New England states. Kevin thoroughly enjoys both introducing new dancers to the fun, fitness and friendship of square dancing and also directing experienced dancers through an interesting evening of musical maneuvers.